After the date has been set, the flowers have been ordered, and the dress has been fitted, the focus of wedding planning turns to the more intricate details of the ceremony and reception - especially music. But because of the sheer number of songs to choose from, the task of selecting the right wedding music - and the right musicians - can be overwhelming. 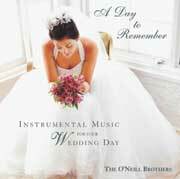 With performances at more than 200 weddings between them, piano-playing brothers Tim and Ryan O'Neill have combined their wedding music expertise and recorded their latest CD, "A Day to Remember." The CD and corresponding sheet music book are designed to help busy brides and grooms select the perfect music for their big day. "Music helps set the tone for the entire event, whether it's traditional, contemporary or religious," says Tim O'Neill. "Many couples have a favorite melody or style in mind, but often struggle to find exactly the right music." Having planned their own wedding ceremonies in recent years, Tim and Ryan have a new perspective on what brides and grooms go through to get everything just right. Consult with your spouse-to-be. You might be surprised at his or her interests or preferences. Your husband-to-be might have his heart set on a particular song, or your wife-to-be might want to include a traditional family favorite. Look at the big picture. Determine the best style of music to use based on the overall theme and feel of your wedding ceremony. Is it traditional? Contemporary? Religious? Romantic? Fun? Not all music is the right fit for all types of weddings. Not all musicians are created equal. Select musicians who are comfortable with your chosen style. If your ceremony is traditional, how about a string quartet? Contemporary? Maybe just a solo pianist, or perhaps a saxophone player. Religious? Check with the wedding coordinator at your place of worship to get the names of the most sought-after musicians on her list. Does someone in your family sing beautifully? Consider inviting them to sing for your wedding to make the experience even more special. But remember that if you ask someone who's not a professional, you'll have to cut them a little slack if they're not exactly perfect. You might want your uncle to play the accordion, but be sure to find a song that fits your style and his ability. Determine the parts of the ceremony that you'd like to set to music. You can select as little or as much music as you like for the ceremony, but keep in mind that your guests will be there to celebrate with you, not listen to a concert. Make sure that you select just enough so there are no "bare spots" during which your guests might become fidgety. Potential parts of the ceremony to be set to music may include the prelude, the processional (you may select separate pieces for the wedding party and the bridal entrance), congregational hymns and religious ceremony responses, the lighting of the unity candle, the recessional and the postlude. If you're having trouble narrowing your selections, you can always save some of the songs for the band or DJ to play at the reception rather than trying to cram them all into the ceremony. If you're marrying in a place of worship, remember to get your list of selections approved by the wedding coordinator or celebrant. Ask for advice - if you need it. If you're particular about your musical choices for the big event, you may want to wait to book instrumentalists or vocalists until you've made your music selections. If you're not fussy, and would welcome the help choosing music, hire professional musicians and trust their advice. They've likely played for many weddings before, and will have great song ideas. Provide the necessary tools. Once you have finalized the song list and booked your wedding musicians, don't forget to provide the sheet music for the pieces you've chosen. Work with the contact person at your venue to arrange for a practice session in the space prior to the event. Trust your instincts. Bottom line - it's your wedding. Don't feel pressured to include a particular song just because Cousin Merle says you should. For more wedding music suggestions and to listen to samples of the songs included on "A Day To Remember," visit www.pianobrothers.com.